Nina is a recent graduate of the the University of Texas at Austin, having earned a B.S. in Civil and Environmental Engineering and an interdisciplinary certificate in Sustainability. While attending school, she contributed to several clean energy studies through the LBJ School of Public Affairs. She was also actively involved in service efforts, with soft spots for low-income students, families dealing with cancer, and Austin’s homeless population. She also led a student team in designing, funding, and constructing a community center in a South Indian village. As a first-term project manager, she emphasized strong team, client, and community relationships, setting the groundwork for a resilient and empowering year. 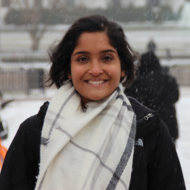 Having lived in several parts of the world and now making a home in DC, Nina aims to bridge her STEM background with socioeconomics, urban planning, and social media to strengthen and support communities around the globe. Clean energy is a complex field filled with endless twists and turns — from local policy and technical challenges all the way down to the varying interpretations of “clean energy” as a concept.